Ban Backyard Pools to Prevent Drownings? 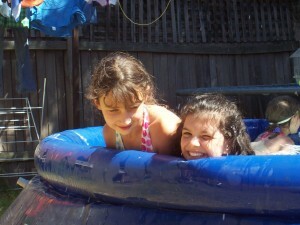 Readers — This is a post from Australia’s iVillage about a true concern: Death by backyard pool. There as here, drowning is one of the leading causes of child death. Heartbreaking. Nonetheless, banning pools seems like a bad idea. How come? I understand one always wants to take measures to prevent deaths, but 16 deaths a year is 0.00000064% of the population. Without sounding horrible that is a very low figure to punish 100% of the population with, and force 100% of pool owners to fill in their pool regardless if they have kids or not – and I am assuming at their expense? This line of thinking is not a very comforting direction for our future. I’m with Jon. – L.
Everybody out of the pool? “Strangers in the Schools” Video Contest Winner! Would You DARE to Play with This Toy? 70 Responses to Ban Backyard Pools to Prevent Drownings? Insane woman, that should never have been given her 15 mins. I used to like to play lawn darts. I was happy to see that most of the comments are anti ban. The argument that cars are a necessity are pools are not is silly. As is the argument that pools should be banned because they are a luxury item. Yep. Let’s ban all fun because fun involves risk. Have children tied to their desks all day, with helmets and safety belts of course. Drug each and everyone of them into a compliant stupor, and see to it that none of them move, lest they make violent gestures, and not speak, or they may communicate dangerous ideas. When they sleep, it shall be on a thin mat on the floor, (can’t have them falling out of bed) with no pillows or blankets so they do not suffocate. Outlaw all cars. Remove the sight and influence of all men and perform a thorough background check on every one else that is in contact with each child. All clothing children wear shall be made of organic coffee filters which are breathable and impossible to strangle themselves with. No peanuts, no strawberries, milk, eggs, chocolate, sugar, or trans fats. All exercise must be done walking slowly in large circles in a padded room. Above all, no childish behavior is to be allowed during childhood. Hah. Bad carrot/stick balance, and of course the carlephant in the room is still ignored. Other thought: maybe she just wanted to make people aware of the risks around pools and children and took an extreme position to make the media spread her message. When I was a kid, I wanted to learn to swim, so I was finally allowed to hang around in pools on my own. That is the protection kids need. Don’t ban pools, don’t cut on school swimming lessons or public pools. Learning to swim is the best defense against drowning — especially in such a wet country as the Netherlands where I live. My son almost drowned in a backyard pool with me and two other mothers right there. The problem is that my friend had the REQUIRED fence which means that he managed to get around the fence, through the gate, and in the pool but I couldn’t just jump in. Nope. I had to run all the way around the pool to the gate and then swim to him. Worst second of my entire life. The problem with banning is you never eliminate the risk, you just transfer it. So take away the pools and the non-swimmers will find other bodies of water to drown in. Good luck trying to ban all bodies of water. The best defense is early education and swim lessons. Toddlers, fully clothed, can be taught to flip onto their backs and find their way to a wall and safety if they fall in accidentally. We started swim lessons at 18 months for all of our kids. I personally view swim lessons as essential as car seats. Water safety course for young kids are proven to save lives. Bans do not. Would this even make a difference? If these children don’t have a backyard pool to swim in they will have to go to the beach instead, where they can drown just as easily. Unless they ban swimming altogether. Maybe instead of banning pools they should make swimming lessons and first aid mandatory. What does this woman expect to happen once backyard pools are banned? Swimming at public pools, lakes and rivers will go up, along with an increase in drowning rates at public pools, lakes and rivers. Does she want to ban all swimming? This reminds me of that fable about the guy who tried to cheat death by going to another town, only to find death waiting for him in that town. Children choke to death a lot too. I think we should ban food. And kids die of SIDs. We should ban sleeping and napping. You know, the more I think about it, to make sure no child ever dies we should ban giving birth to children. wow. they dont have fireworks in australia either. bummer. Doesn’t Australia have the highest rate of skin cancer? Ban all outdoor activities and keep kids out of the sun. Indoor only children. But household accidents (stairs, tubs, poisonings)kill so many young children too so we should ban houses. And births. It is probably safest they never are born because no one here gets out alive. This type of logic is utterly insane. I love swimming pools and children swimming and teach them to embrace life, risks and all. This one is almost too easy. People like this are so out there that highlighting them almost functions as a real-life straw man — in this case, a real person has made the argument, but it doesn’t look like anyone’s taking it seriously. Ridiculous. How about just making sure your kids don’t get around pools unsupervised? Meaning watch smaller children who don’t know better, train and educate older children to never swim alone and stay out of pools without permission, put up fences or covers or alarms on your pool. Done. If the above was done then there would be zero drownings. It is your job to watch your kid period. I grew up with pools in the backyard from 8 years old to high school. I knew not to swim without permission and not alone. It was not a hard concept. Let’s play devil’s advocate by introducing some more ‘worst first’ thinking 🙂 .Wonder if this woman has paid any attention to fire risks, which are bigger in Oz than in much of the rest of the Western world. My dad was a fireman in our very small Kiwi town (all volunteers of course) and we were always jealous of our farm mates, all of whom had backyard pools. He claimed these were required in case of fire – they were an excellent first source of water, particularly in dry years. So I hope, sigh, that she plans to make an exception for rural areas. Should the authorities be crazy enough to go along with her….. Here in southern California, any such move would be about as popular as proposing a ban on firearms in Texas. Someone once commented on the amazing number of backyard pools that air travelers could see while flying into LAX. And it isn’t just in LaLa Land–I remember riding a Boston area commuter train and noticing a considerable number of backyard pools in a place where they probably turn into skating rinks in the “wintah”. Wait, I’m confused…isn’t Australia an ISLAND? What are you going to do, ban the coast, too? Seriously, extreme worst first thinking. I feel like this would backfire greatly. Less kids would learn how to swim, either because they lack to opportunity or because their parents didn’t see a need to teach them with no pools around. And kids need to learn how to swim. There’s so many activities based around being in the water now, plus it’s just good to know how to stay afloat in a substance that covers 70% on out planet. I grew up with a backyard pool, playing in it every single day during the summer. Being in the water is like second nature for me. I’d guess I’m safer with my experience with the water than other people my age who have been kept out of pools for fear of drowning. To me, Free Range Kids should be about refusing to take major action against *extremely*rare* events. But if that’s your philosophy, you need to be *highly*aware* of the difference between an extremely rare and a rare and a common event. I think when we deal with REAL, non-made up risks like this one, we must keep an open mind. It may be that banning backyard pools is an over-reaction. It may be a bad idea. But it’s not crazy to discuss it, in the way that, for example, banning kids from walking to school to avoid abduction is crazy. This is a different league. Calculating risk is hard. Differentiating near-zero risks from real risks is key. Why can’t this woman let other parents decide for themselves whether they want a pool or not. Don’t decide it for me. This may sound callous but why are some people so concerned with other people’s kids? used to be we had mandatory swimming lessons as part of primary school PE once a week for 6 years. Since those were cut to save cost on the education budget and because Muslim parents complained that the lessons weren’t segregated (no kidding), child deaths by drowning have skyrocketed (and mostly those are kids of Muslim parents, natives tend to teach their kids to swim anyway, not a bad thing when the nearest waterway or lake is almost always within walking distance). Banning pools will have the same negative effect in Australia, unless maybe it’s in the middle of the desert where there’s no other way to get into any body of water in a wide area. And then the ban might well have ulterior motives, i.e. to save water, reduce the need to build more water processing plants to feed the ever increasing demand for the stuff from home owners (for that reason alone I’d be all in favour of a ban on golf courses). @K the assumption that cars are a necessity is plain wrong. *Transport* is a necessity! but that’s different. We as a society decided to place a high value on nearly arbitrary personal mobility and divert extremely large sums of tax money towards that goal. Bit agains, that’s mostly await, no need. Yes TRANSPORT is a necessity. But not every single person needs a car. My grand parents didn’t have one for a long time in Toledo. My mom took two buses to get across the city to school. They eventually did get a car but just one. My other grandparents lived in rural Michigan, so they had a car, although my dad and his siblings either walked or took a bus to school. Again, one car for the whole family. I’m in baltimore and parking continues to be a problem because of all the cars. My family has two. The hubs has something fuel efficient for his long commute and I have something larger for hauling kids and dogs and grandma and her wheelchair, but I don’t drive it all that much. My insurance guy didn’t believe me when I said I walk, bike or take the bus frequently, especially if I’m going downtown where it costs 20 dollars and up to park. The thing this article does not do is compare the benefits with the risk. It only highlights the risk. Many people have mentioned that pool help kids learn to swim. But what about the simple joy of having a way to cool down and be out doors in the summer. How many hours of safe pool activity have there been? It may seem callous to bring up all the fun of pool in comparison with children’s deaths, but it is not right to only weigh one side of the argument. Don’t ban pools. If the government wants to get involved at all, they should mandate swimming lessons, and make them accessible, free of charge, to children (maybe in school, or maybe even before that), and to anyone who can’t swim reasonably well. Adults, homeschoolers, and any individuals who aren’t enrolled in public school, could take a swimming test, and then if they don’t complete it, they could be eligible for free swimming lessons. That’s the only true way to ensure safety, especially in a place like Australia. A backyard pool is about the tamest body of water you’ll find in Australia–I lived there for two years, and swam often, in the university pool, in the pool at the beach, in the pool at the community centre near my house, and of course, in the ocean. The house that I lived in didn’t have a backyard pool, but look at all of those opportunities I had to drown–I mean, it’s a wonder I’m still alive today!!! Actually, the reason why I didn’t drown, is because I can swim, and the reason why I can swim is because my parents made sure I learned as a child, and I did, from infant parent-and-child classes through to lifesaving. I’m not saying that everyone needs swimming lessons that are that comprehensive, but everyone should be able to at least swim one lap of a standard public swimming pool, barring physical disabilities. Then maybe the government will see swimming as just a fun and healthy activity, rather than an opportunity to drown. Wow, where did you find that? I’ve seen a 2007 news outlet from the Central Bureau of Statistics saying the number of drowning victims has been decreasing for years, and I found the numbers of drowning victims under the age of 15 for 2007-2010 (11, 14, 14 and 12, respectively), and I’ve seen a website quoting a CBS graph that showed that the number of deaths by drowning age 5-10 skyrocketed all the way from 3 in 2010 to 3 in 2012, plus there were some articles of last year about drownings, but the victims were most often adult immigrants from Poland and the like. So I’m curious to see where you digged this up? How many kids have drowned in the bathtub? Yet as far as I know, they are not banning bathtubs. That’s because bathtubs are a source of work, not enjoyment, for moms. Let’s get our priorities straight. If children can figure out how to open a pool fence, they’ll probably figure out some other way to enter an equally “dangerous” body of water. Sure, you can focus on all the negative side of statistics for anything, but why not just enjoy life and keep an eye on your own kids instead of depriving mine? @Papilio, not in the US. And here too it’s stabilised now, but at a level quite a bit higher than before they stopped teaching kids to swim. This falls in line with the same reasoning as banning handguns. Sure, some lives would be saved but many many more would be needlessly penalized. If pools were banned when I was a little kid in the early 60s, I would have NEVER learned how to swim. My father was a helicopter dad when it came to lakes and would never allow me to go to the beach with my friends, even for swimming lessons. His argument was that if a person goes down in a lake, nobody will see them under the brown murky water whereas in a clear chlorinated pool you could easily spot a child in distress under the water. So thank God for the city swimming pool in my small Wisconsin hometown that was built in 1962! Of course, this article is speaking specifically of backyard pools and not city pools. STILL an over reaction in my opinion. @JT Wenting: What is ‘not in the US’? This isn’t about political correctness, I’m just interested in the facts. The facts I found don’t support your claim, simple as that. But then again school swimming hasn’t been dropped that long ago, so perhaps there are more recent data that do back up what you’re saying, in which case I’d like to see the stats/numbers myself. Actually for the vast majority of the US, it is not different. We have very limited and largely inconvenient public transportation systems in large portions of the country. For example, we have a city bus system that can get me many places within the city limits … as long as I only need to travel between 6a-10p and never on Sunday. If I have to actually leave the city limits, I’m largely SOL. Since my job requires me to leave the city limits nearly every day, I would be unemployed without a car. While infrastructure could be built to allow us to travel anywhere without a car, that infrastructure doesn’t currently exist. Until it does, transport does equal cars for many Americans. Don’t get me started on backyard swimming pools. I’m grumpy on this one. 1. Privatize an activity that was once much more community-oriented, thus further isolating people from their neighbours and discouraging funding for public facilities because everyone has their own “private” pool. 2. Backyard pools use a lotta water. Something that will definitely become a hot topic (pardon the pun) in the coming years in water-poor, hot places in the US and Australia, South Africa, etc. 3. There’s just something wretchedly excessive to me about having a pool in your yard. It’s so demanding of resources, not just water but land, etc. I can see folks in the near future bemoaning how this trend became popular. 4. Who cares about drowning individuals? Teach kids to swim. We’re drowning ourselves by being so piggish and short-sighted about the use of resources. 1. Privatizing a once community activity? Do you know how many community pools are being closed because of budget cuts? And how over regulated they are, as to what you can do. Our pool is center of our community. Kids from the area are always here. Weekends, we have family over all the time. Big BBQ, some beer, in and out whenever and however we want, lawn games, and family. We are outside from morning until the skitters get too bad. Our pool is great for family and friends. It brings us all together for quality time. They usually show up Fri. nite and don’t leave until Sun. nite. 2. My well, my water, and I figure since I do not water my grass ever, then it is a fair trade off. And other than the pump, power consumption is low. Heat the water with the sun, and black tubing. Works great. 3. Have acres of land so the 40 X 80 area taken up by deck and pool is about the size of a postage stamp, on large envelope. And besides, our money, why not. Now the resource that is horrible to pay for is food, the neighborhood kids eat us out of house and home. If we ever move, the next house has to have a pool, or at least a yard big enough to dig up and put one in. 4. While you are sweating and worried about the future of water, I’ll be floating in the pool, relaxed and enjoying an ice cold beer, this summer. @Warren–I know it’s rude to invite oneself to other people’s houses, and I also know that we don’t even live close enough together to make it really feasible (I don’t have a car), but your pool weekends sound incredibly fun. I wish I could participate. 🙂 As for the food problem, have you ever mentioned this to your friends and neighbours who regularly drop in to swim, and maybe suggested a potluck arrangement for the food? Suppose you provided something like Popsicles or freezies, and whatever you plan to barbecue (because these things have to be frozen), and then the neighbours could provide the buns, chips, condiments, etc. I mean, if all of these people feel that they’re close enough friends with you that they can drop in and swim whenever, then you’re probably close enough to be straight up about the food situation. In any case, you sound like a really cool dad, by being willing to provide a safe, lifeguarded pool (since you’re the lifeguard) for the whole neighbourhood. Your kids are going to grow up with a lot of positive summertime memories…..even if that pool is only really functional for two or three months of the year. Yesterday, I had to go to a courthouse 16 miles from my office twice. Today, I had to go to a jail 60 miles from my office. Tomorrow I have to go to a courthouse just a couple miles from my office and then go to a second courthouse 20 miles from there. Thursday I have to go to a jail 22 miles from my office. Next week is a slow week and I only have to simultaneously be in 4 separate courthouses in 4 separate counties on Wednesday. But I guess you are correct, I do have the option of choosing not to work and living off your tax dollars. It’s interesting how the discussion morphed into transport from recreation/exercise. I read the Streetsblog websites, which are run by advocates of non-private-car transport, and they preach the joys of walking, bicycling and transit. But when I go out to run errands, the vast majority of travel seems to be in owner-operated vehicles. Unless you’re in a place like New York, Boston or San Francisco, the legacy of Henry Ford is all around. The weekend get togethers, it is all give and take, as family and friends bring food and booze. It is the kids during the week that cost us probably an extra $200 a month when school is out. Not worried about it, we can more than afford it. Our pool is open from Mid April to Thanksgiving here in Canada. When the nights are too cold, we use the wood stove in the shop as an aux heat source. This summer, my bride and I are adding a hottub to our outdoor life. That puppy will be an all year user. Oh and by the way, I am not out there with them all the time. Our rule, if your kid cannot be trusted in the pool, then you come over to watch. I listen, and do periodic checks. I do not want our own pool. Too much liability and maintenence and money. This past Summer though we joined a community pool and it was great. We went swimming almost every day that it did not rain. My kids got very familiar with the water even though they still won’t swim much without their floaties. It gets so hot here the only way we can be outside in Summer is if we are in a pool. So this was how we got out of the house. We are doing it again this year. The best part is our fee covers lifeguards. We only stay in hotels with pools. Indoor pools for winter or outdoor for summer. Swimming is a great activity for kids. Great way to get exercise. People just need to be smart about it. Two kids drowned in a cruise ship pool recently. I am not sure on the details but they think they snuck out of the cabin room early in the morning and no one noticed them including the sleeping parents. That is a horrible tragedy. But things like that can be prevented. Don’t get a room near a pool. Make sure you use the room door lock that is up high (most hotel type rooms have them, the security lock. We always engage ours in hotel rooms when the kids are with us). Leave your door open so you can hear the kids if they get up. As far as the whole public transit stuff, that is great for cities. If you live in the country or suburbs there is no public transportation. Our area has no sidewalks except in certain parts. It is not pedestrian friendly. We still like to walk and walk to school and to the corner store but we just have to walk on the road and watch for cars or cut through parking lots. The main part though is that most things are super super spread apart so that even walking is impossible. It takes me 20 minutes to drive to the pediatrician. Try walking there. Our mall is 15 minute drive away. The Walmart is about 10 minute drive away. My husband did walk there one day but I had to go pick him up. Nearest grocery store is about 7 minute drive away. There is no buses out here. No sidewalks. No trains. So it is basically have a car or walk and only be able to get to places in walking distance which are few and far between. @Warren–If you’re happy with your de facto community pool arrangement, then I’m happy for you. As for the hot tub, I’ll believe that–my next-door neighbours have an outdoor hot tub too, and they use it all winter. It doesn’t look very comfortable to walk outside in the snow in a bathing suit to get to and from the hot tub, but to each their own. Yes, drownings can be prevented, in the same manner that every single accident that ever happens can be prevented, but until children are raised by a 100% perfect species with the ability to tell the future, they will never be completed prevented. My stepbrother drowned when he was a toddler. He was able to be revived, but suffered cognitive and behavioral issues that may or may not have been a result. We’ll never know. His uncle was babysitting, laid down with him to get him to take a nap and fell asleep himself. When stepbro woke up, he slipped out of bed without waking his uncle and went outside. At the same time, the neighbor who had been in his pool, ran out briefly and left the gate partially open. Stepbro walked in and jumped in the pool. He was discovered by the returning neighbor a minute or two later. Every step of this could have been prevented if people were perfect. But we aren’t. Tired adults will continue to accidentally fall asleep with kids. Toddlers will continue to unexpectedly slip out of bed without waking the sleeping adults. Toddlers will continue to have a first time that they can open a door. People without young children will continue to not think about the possibility of marauding toddlers from the neighborhood when they run into their house to grab a drink. I have absolutely nothing positive to say about my father’s second wife except that she handled this situation with grace. She accepted it for what it was – a tragic accident that had a one in a million chance of happening but did – and she never said a single negative word against her brother or the neighbor. This is not to say that I think we should ban pools because we can’t prevent deaths. We need to accept that people, even children, die. We should do our best, but perfection will absolutely never to attained. Our good friends down just down the road, maybe half a click, have a hottub. And relaxing in it is incredible, in the winter. The thing is to, you raise your body’s surface temp, and a layer of hot water on your skin that when you go from the tub to the house, you really don’t feel the cold. We were going to get one before winter, but we are waiting because we want to reconfigure the deck to do this properly. And horses cost more than cars. And they have to eat EVERY day, whether they take you somewhere or not. I live in Scottsdale (yes, i know i’ve said that 1000 times) which has to be the child-drowning capital of the world! In the 20 years I’ve lived here, I have NEVER heard of a young child drowning that could not have been prevented by vigilance and a responsible adult. ALL pools should be fenced and LOCKED and the fence must be checked for breakage once in a while. When children are in the pool there MUST be ONE adult designated as the watcher..(more if there are a LOT of kids in the water.) There is no excuse for less than vigilant behavior with kids around water. In my mind, it’s the same as “forgetting” to put a child in a carseat. That said, banning pools is ridiculous. Stop taking away choice instead of requiring responsibility. At what age do you finally allow them to swim unsupervised? Re transport stuff: I begin to sound like a broken record, so sorry in advance, but I honestly think – from what I can see – the USA could well use a big revision of the infrastructure. Private transport on large distances will always be a necessity and it’s a waste of time to try to talk people out of that (as Donna shows 🙂 ). No-one is saying everybody should always cycle those short trips, whatever the weather or hills or the load or having to haul 3 kids under 5 with you – of course not. But providing an alternative to the car, a safe, convenient, healthy, cheap (for everyone!) alternative, at the very least provides drivers with a choice, and non-drivers (free-range children for instance) with a lot more freedom. And if that isn’t worth it in the Land of the Free, I give up. Think how many more children could be saved if they banned cars. I checked out the stats, and it seems clear that NOT letting kids swim (i.e. learn how) is one of the biggest factors in child drowning deaths. How are kids going to learn how to swim if they don’t get an abundance of pool time? Why isn’t there a PSA out there telling people that they must get their kids into the pool, early and often, if they care about their safety? As for when it’s OK for kids to swim alone – it’s a bad idea for anyone of any age to swim alone. Unless you’re an Olympic swimmer. My kids are better swimmers than I am. But they are 7. I will probably insist on them having adult supervision while swimming for at least a few more years. After that, they should be fine as long as they are together. So when I get home from a call at 3am, and want to do some laps to unwind, I should wake up my wife to watch me? Bull. Never swimming alone is another one of those paranoid rules. Like hiking alone, cycling alone, fishing alone. These are things some people like to do alone, to be alone. In our pool, as long as you can stand flat foot in the shallow end, and it only be shoulder depth, direct supervision was not deemed necessary. I could go about my day, keeping my ears open and periodic peeks at the pool. Never had anything more than the normal bumps and bruises of growing up. Warren–I don’t think there’s a magic age. I think as a parent you know your child, just as you decide when s/he can walk to school alone, babysit, etc. Most child-drownings happen to 2-3 year old boys. 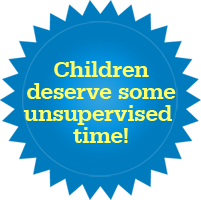 I think it’s safe to say that children that young should not swim unsupervised…However, I did leave my kids that age with a kiddie pool and check them frequently, which is controversial, I imagine. I would not do that if I were caring for somebody else’s child. I also subscribe to the idea that it’s not a good idea for anyone to swim alone, although I agree that adults should make their own choices. In our house, the rule applies because it is OUR own pool and we make the rules (we have so few rules) and though I’d prefer that my adult kids don’t swim alone, they make their own choices when they aren’t at my home. Gina, I agree with most. But cannot help thinking that even an adult needs supervision is overboard. Yes I am well aware of how quickly someone can drown. It takes alot longer to drown than be hit by a car, slip in the shower, fall down the stairs and yet I do not worry about those risks. Just saying. Warren–i agree that drowning is not instant. I worry more about slipping and hitting the head and THEN falling into the water already unconscious. I know it’s a long shot but living in AZ, I really do hear about more than my share of stupidity around pools. Papillo, you’re not saying anything the US hasn’t been saying for decades. Our roads are old and cannot support the amount of traffic. In my city, our roads are taking a big hit from this winter. In January alone, there were 350+ water main breaks. Not to mention sinkholes. Finding the money to pay for it is an issue. As much as I dislike DC, you can get pretty much anywhere by taking the metro. You might have to plan ahead. A friend who lived down there for awhile said she had to make sure if she stopped for groceries on the way home, she couldn’t buy milk and orange juice on the same day unless she wanted to lug heavy bags on and off the train and carry them three blocks to her apartment. Taking a bus or a train somewhere requires knowing the schedule and then making sure you get to the stop on time. In January, I took my daughter to a birthday party and we had car trouble. My husband was over an hour away and heck if I was sitting there to wait for him. We took the light rail (an above ground train that travels in mixed traffic) downtown, where we then caught a bus that went to our neighborhood. It seemed simple to me, but plenty of people said they didn’t know enough about our transit systems to be able to do that. I don’t think that is true at all. It’d be great if I could take public transportation on some of my trips. The ones where I am pushed for time, I couldn’t, but for others it would be great. I could use the time to work instead of it being dead time in my day. But either public or private transport is necessary for large distances and there is no reasonable public transportation in large portions of the US. I didn’t choose to take my car to the courthouse 20 miles away today. I took my car because there is absolutely no other reasonable form of transport to that location. The closest bus stop is about 15 miles away. No rail system exists. Considering feet, bike, horse (which is illegal to ride in the city anyway) or skateboard as a reasonable method of traveling 20 miles each way to work is idiotic. I’m not sure where you get that the half US trips are under 3 miles. I suppose that may be true in some areas, but half the people I know work 20 or more miles from their homes. The ones that work within 2-3 miles do frequently walk, bike or use the university buses (as most are going to the university) to get there. Well my mom lives in the country and the closest grocery store is probably a 30 minute drive on an empty highway with no red lights and only a few stop signs. I don’t know the miles. So probably a crap ton of miles. Nobody is walking or biking that. @K: I also read that states can get subsidy for building *new* roads, but not for maintaining the existing ones. So it’s very tempting to just build new ones… What does the US say about that? From what I’ve seen, the money’s often there, it’s just a matter of spending it more wisely (but there could be stupid laws and rules in the way…). Sorry winter messes up your roads. How do other cold areas solve / deal with that problem? @Donna: You are right, I too like to travel by train so I can read etc on the way. But I wanted to acknowledge that the US is pretty big and building railways is expensive, so it’s not suitable to connect every single little village to the railway network, and although buses are cheaper, if they remain (almost) empty it’s not realistic to keep them riding around (rural areas here face that problem too). So especially for people in remote areas a private vehicle remains very important. But I agree that in (more) urban areas it should be possible to build a reasonable PT network. It’s possible it referred to urban areas, but then again those areas are the most realistic targets for bike travel anyway. I don’t understand why you mention commuting when it’s about short trip distances. Surely you leave your home for more purposes than just work? Or are all your other destinations even further away??? This is the most common sense answer I have heard to date! This nonsensical banning of everything that a minority deems “dangerous” is getting out of hand. As the post by Jon S. says, eventually all liberties will curtailed in order to accommodate the smallest number of complainers. This new generation is going to grow up with the least need for responsibility for self. Their parents already feel that they themselves should be ‘taken care of’, because anything adverse that happens is someone else’s fault. Growing up and taking responsibility for one’s actions has gone missing in this environment of restrictive governmental laws.